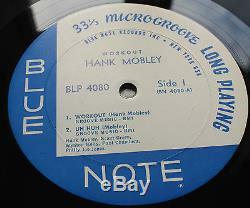 HANK MOBLEY: Workout , US Blue Note 4080 New York MONO Pressing, with'ear' in dead wax, both sides. DISC is MINT(-), looks perfect! Plays with near perfect sound! Best vinyl you can imagine. COVER is EXCELLENT+, see pics. 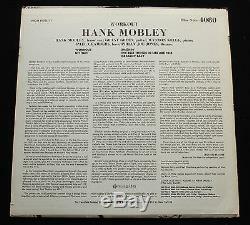 Exceptional copy of this superb Hank Mobley LP! All LPs are cleaned on the. Audio Desk Ultrasonic Vinyl Cleaner. You will NEVER pay more than my actual cost. Special german-made cruciform-mailers designed for multiple LPs are used, even for single LP packages. The boxes are oversized and thus provide extra corner protection as well as great stiffness to the package. Addtional protection may also be used when found nessesary, such as stiffeners, bubble-wrap, extra corner-protection. I do not charge anything for packing materials. Is as close to new as a used LP or cover can get, unplayed or played 1-2 times at most with no visual sings of use on surfaces. No marks, scratches, clicks, noise, or anything else, aside from possibly a barely visible and inaudible hairline or two. All minor blemishes will be mentioned in the individual descriptions. S also VERY nice, 2-3 light inaudible marks/hairlines perhaps, no disturbing noise, great sound quality. Lower gradings not relevant here.. In case of any dissatisfaction, contact me, and we'll sort it out. 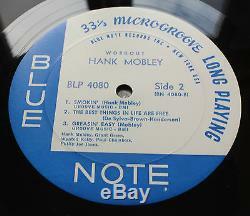 The item "HANK MOBLEY Workout US Blue Note 4080 New York MINT- LP'ear' MONO Superb" is in sale since Tuesday, June 28, 2016. 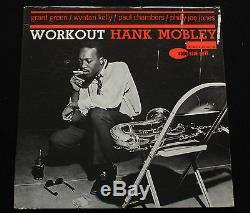 This item is in the category "Music\Records\Albums/ LPs\Jazz\Bop". The seller is "cross_road_blues" and is located in Frb. This item can be shipped worldwide.